An area of modern Pembrokeshire, on the southern edge of Mynydd Preseli, within the medieval Cantref Cemaes. Cemaes was brought under Anglo-Norman control in c.1100 by the Fitzmartins who retained it, as the Barony of Cemaes, until 1326 when they were succeeded by the Audleys. The Barony was conterminous with the later Hundred of Cemais, which was created in 1536, but many feudal rights and obligations persisted, some until as late as 1922. The Mynydd Bach character area belonged to the mesne lordship or manor of Maenclochog, held from the Barony of Cemaes by the Roche lords of Llangwm in the 13th- and 14th- century, when it was assessed at one knight's fee. In 1594, Maenclochog was - like other Cemaes manors - held on an annual lease from the Barony, this one being assessed in an Extent at 3s 8d. However, like most of the southeastern part of the Barony, within Mynydd Preseli, this area continued to be held under Welsh systems of tenure. The character area is now enclosed but during the medieval period, the entire area appears to have been unenclosed moorland pasture. In 1301, David de la Roche granted the monks of Whitland Abbey grazing rights for horses 'on Preseli and the waste places thereabouts for seven years, at one penny and thereafter 2 shillings'. Charles Hassall's record, in 1794, of the 'extensive waste' persisting in Maenchlochog is reproduced in the County History. Some of this land may have occupied the Mynydd Bach area which remained without enclosure until 1815 when it was subject to a Parliamentary Inclosure award, of which the present system of large fields with straight boundaries is typical. 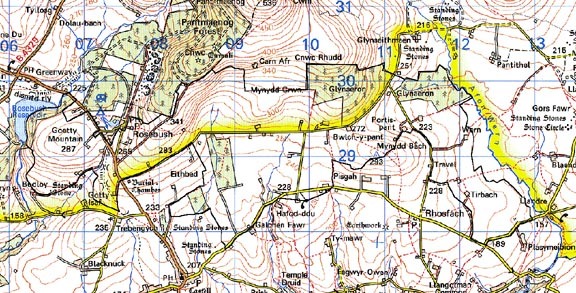 With the exception of Bwlch-y-pant, recorded in 1503, and the 17th century Eithbed-fach, which probably represent hafodau, the present settlement pattern of farms and cottages, and most of the roads and tracks, dates to 1815 or soon after. The western end of the area was crossed by the Maenclochog Railway, opened in 1876, to serve the quarries at Rosebush, but closed in 1949 . Mynydd Bach historic landscape character area consists of a wide strip of enclosed farmland fringing the southern slopes of Mynydd Preseli. The land is south-facing and gently-sloping, lying between 200m and 340m. Fields are regular in shape, approximating to a square, and small- to medium-sized. Boundaries are earth or earth and stone banks. These are topped with hedges. Apart from alongside lanes and tracks these hedges are not well maintained and most have either disappeared or are reduced to a few straggling lines of bushes and gorse scrub. Wire fences on the banks provide stock-proof boundaries. 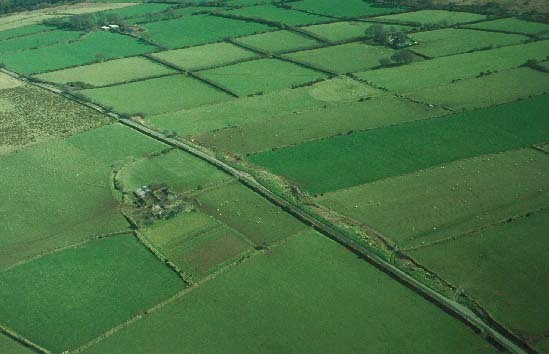 Agricultural land use is a mixture of improved pasture and unimproved grazing with rougher grazing and rushy ground in wet hollows. At higher levels fields and some farms have been abandoned and are reverting to moorland. There is some scrubby woodland in some of the hollows, and four small- to medium-sized 20th century coniferous plantations lie in the area. Other than the plantations and scrubby woodland, trees are confined to small stands that provide shelter around farms. The settlement pattern is one of dispersed farms and cottages. The dwellings are mostly 19th century, one, one-and-a-half or two storey, three bays, stone-built (rendered and/or bare stone), slate-roofed in the vernacular tradition. Other types of dwelling are present, such as a mid 20th-century single storey corrugated-iron cottage, and 20th century houses in rendered concrete and brick. These latter houses are usually replacements of earlier, 19th century, farmhouses. There are no listed buildings in the area. Apart from the abandoned railway and the B4313 which crosses the western part of this area, transport links are confined to lanes and tracks. These are characteristically straight and have a verge of 5m - 6m between road-edge and hedge-bank. This contrasts with the narrow winding lanes of the surrounding areas. There is a fair density of recorded prehistoric archaeology within the Mynydd Bach area including a possible neolithic stone circle, a scheduled standing stone and a cremation or barrow, two possible standing stones and possible stone pair, a possible stone row, a possible round barrow and a possible burnt mound, all from the bronze age. Other sites include a possible enclosure of unknown date, Goetty Mountain quarry, the railway and a world war two military camp near Rosebush. Mynydd Bach is sandwiched between the open moorland of Mynydd Preseli, some of which is now afforested, and the lower-lying more anciently settled farmland of Maenclochog and Rhosfach to the south.